Kedarkantha is a popular trekking destination among adventurers because of its easy accessibility throughout the year. Your drive to Sankri, the start point of the Kedarkantha trek, is a highlight by itself, taking you through Mussoorie and along the Tons river. You'll be camping at a vantage point on your second day, where you'll wake up at dawn to watch the sun drench the snow-capped peaks in golden light, after which you'll tuck back into your bags for a couple of hours of beauty sleep more! 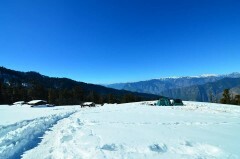 Trekking through pine and oak forests, crossing patches of snow, and camping at some stunning locations makes this Kedarkantha trek a memorable experience. Kedarkantha lays in Govind Wild Life Sanctuary and National Park in Uttarkashi, which is a stunning location in itself. You'll find yourself bird-watching as you go higher up, entranced by the unusual flora and fauna here. You'll also get gorgeous views of the famous Har ki Dun valley on the last day of the Kedarkantha trek. 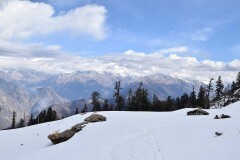 • Trek to Kedarkantha on a challenging route through pine and maple forests. • Camp at sunning destinations alongside ponds in the forest. 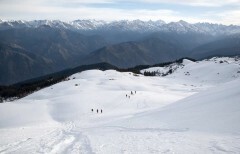 • Enjoy the picturesque view of snow-clad mountains in the Himalayas. Travellers are required to adhere to instructions of the trek leader during the trek to Kedarkantha. For cancellations made on or more than 24 days before departure of the Kedarkantha trek: 95% refund. 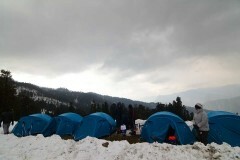 For cancellations made between 14-23 days before departure of the Kedarkantha trek: 70% refund. 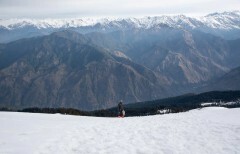 For cancellations made between 8-13 days before departure of the Kedarkantha trek: 50% refund. For cancellations made less than 8 days before departure of the Kedarkantha trek: No refund. The tour operator reserves the right to cancel or alter the itinerary of the trek to Kedarkantha to ensure maximum safety for travellers as well as staff. You can either opt for the transportation arranged by the supplier (not included in the package cost) to drive down from Dehradun to Sankri or can choose to get there on your own. The 10-hour long drive passes through Mussoorie, Barkot etc. along the Tons river, and is a scenic drive. Overnight at Sankri in homestay or guesthouse. Enjoy a scenic drive along mountain roads. After a hearty breakfast, you'll begin your Kedarkantha trek towards Juda ka Talab. It's a four-hour trek, taking up to the famous pond surrounded by pine and oak trees. With its views of majestic peaks all around, this location is a photographer's delight. Overnight at Juda ka Talab in tents. Trek up into the tree line. Today you'll rise at dawn, so you can watch the sun cast a golden glow over the snowy peaks. This will be one of those moments you never forget. You'll dive back gratefully into your sleeping bags for a couple of hours, before waking up again to a hot breakfast. Post-breakfast you will trek for about 4 hours to reach the Kedarkantha base. After having lunch here you can spend the rest of the day exploring the area and prepping for tomorrow's trek. Overnight at Kedarkantha base camp in tents. Snow-capped peaks of towering mountains on the horizon. It's a long trek to Kedarkantha peak today, so you'll begin early to get the best weather. 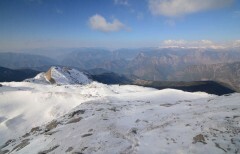 At 11,250 feet, the Kedarkantha peak offers picturesque views of the snow-clad peaks of Yamunotri and Gangotri ranges. You'll have plenty of time to enjoy the summit and the views, before heading back to your campsite. The rest of the evening is spent relaxing and exchanging stories. 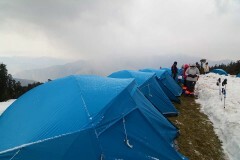 Overnight at Kedarkantha base camp in tents. 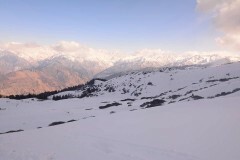 The Kedarkantha terrain after a fresh bout of snow. Today you'll begin your descent to Sankri via Hargaon on a well-marked trail. The trek passes through the thick pine and maple tree forests, and offers some great views of the Har-Ki-Dun valley. Overnight at Sankri in homestay or guesthouse. Trek back through pine and maple forests. Post breakfast, check-out of your accommodation in Sankri and board vehicles that'll take you to Dehradun. You'll arrive at Dehradun after a 10-hr drive by late evening. Your trip ends here. Overnight in a homestay or guesthouse in Sankri. Board a private, shared vehicle from Dehradun and travel to Sankri. You'll be accommodated in a comfortable homestay or guesthouse on triple/quad-sharing basis. Today's meal package includes only dinner. However, you may have additional meals at any of the restaurants en route to Sankri at your own expense. Participants sleep in sturdy tents on triple sharing basis. Couples are always accommodated on twin sharing basis. Overnight in homestay or guesthouse in Sankri. Trek back from the base camp at Kedarkantha to the town of Sankri. You'll be accommodated in a comfortable homestay or guesthouse on triple/quad-sharing basis. Today's meal package includes breakfast, lunch and dinner. Dehradun is well connected by means of road,rail and air. Participants coming from Delhi can board the Nanda Devi express departing from NDLS at night. The tour operator will arrange your transport to the start point of the Kedarkantha trek.